When today’s guest was a budding filmmaker and expectant mom, somebody looked down at her pregnant belly and advised her there was no way she could be a successful filmmaker once she had a baby. But she’s not one to lie down when the going gets rough, and in fact, she made it her mission to prove them wrong. Today I’m super stoked to introduce you to the independent filmmaker of the movie, Twice. 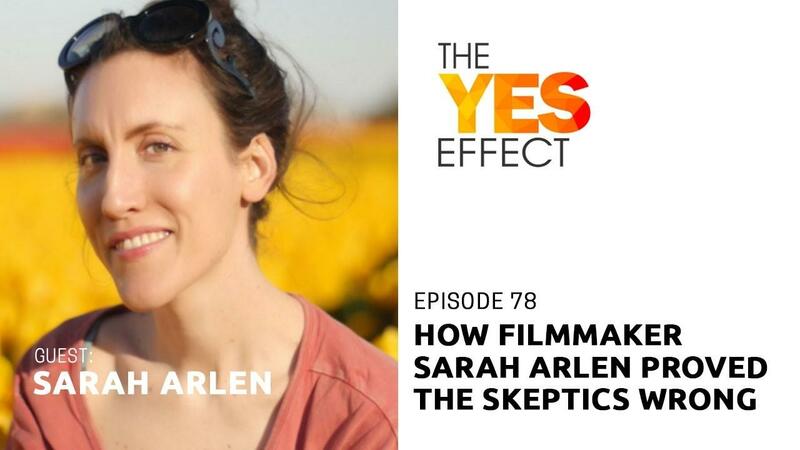 Her name is Sarah Arlen, and this is The YES Effect Show! Sarah Arlen was born behind the grocery store of a small town in California. Having fallen in love with cinema when she was little, she studied acting at UC Berkeley before moving to Paris to get her Master’s in filmmaking and to eat cheese. She won the Jack Kent Cooke Scholarship and made short films before making a human baby. After winning some screenwriting awards, she was told by producers that she could never made a feature film as a mom. That’s when Sarah decided to become a producer. She overcame postpartum depression by realizing her dream: producing and directing her first feature film, called TWICE, and doing it completely independently. By creating a schedule around her son’s school day, and starting out with the resources she had around her, then crowdfunding and finding donation money to complete her movie, Sarah is now carving out a unique new way for filmmakers to bring their work directly to audiences without passing through gatekeepers. One of her biggest dreams, to help other artists and entrepreneurs make their passion projects, is now coming true as Sarah launches her new in-depth online class, MakeTwice. Special thanks to Sarah Arlen for joining me this week. Until next time!